No mountain you have to climb, or valley deep and dark can separate you from Christ. Nothing in creation- no person, no place, no danger, no toil, no frustration, no job, no broken relationship – nothing can separate you from your Father, who loves you. In the marriage relationship, love waxes and wanes. It changes and grows, certainly, but you will have seasons when love is vibrant and seasons where love is dull and even seemingly lifeless. Because of the one-flesh relationship being the most intimate one we will ever experience on Earth, we often relate God’s love to our experience within the marriage relationship. This happens without even thinking about it. In the times we feel unloved and devalued by our spouse, we wonder if there is a God who finds us valuable, who loves us no matter what. We can learn two things from this. First, this verse speaks truth into our lives. God does love us, come what may. He always has and He always will. Nothing in creation, nothing around us or in us, or happening to us, can change His love for us. We cling tightly to these verses as Christians for a reason – our basic need to be loved, to be known and loved in spite of all of it. Second, what can we do in our lives to help our spouse know the truth of this verse? What are we doing daily to grow in love together, so that God can speak to them through us? This may be one of the primary means that God uses to speak His love in to the lives of those around us. If our marriages were unbelievably strong, others may take notice of a God whose love is so deep, so wide and unfathomable, that divorce rates and life challenges and petty arguments have no hold on our marriages. It would be obvious that He is clearly the one at work. This model may be more valuable to the life of the church than anything else we ever do. 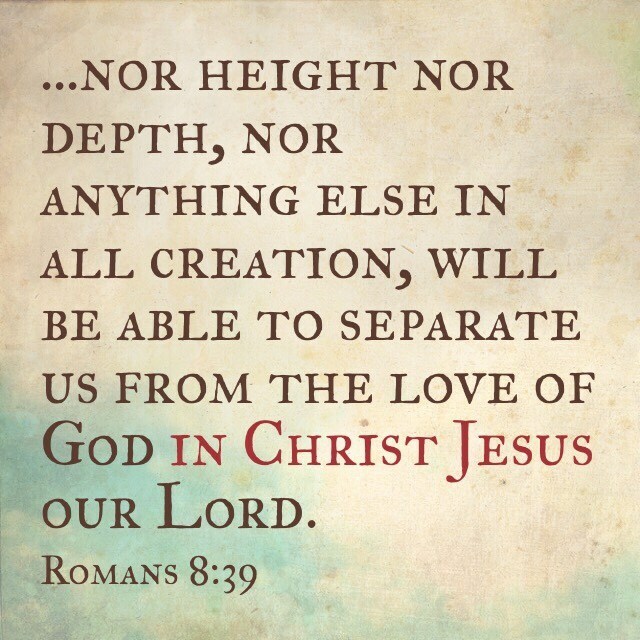 Thank you, Lord, for your inseparable Love. Thank you, Lord, for being perfect in our imperfect marriages. In Jesus name we pray, Amen. The unknown of life is a scary thing. And so much of life is a little unknown. Little children may be fearful of water or new places, or even new food because so much is unknown to them about things. Adolescents have all kinds of nerves about school and relationships because so much of it is unknown. College students wonder where they will live, who they will marry, what life will look like for them- the unknown. In adulthood the unknown doesn’t stop – how best to raise a child, how they’ll turn out, tackling illnesses to come, changes in employment, moving, changes in anything- more and more unknown. We could live our whole lives like this, in our metaphorical dark caves, feeling “safe” and protected. God tells us that He wants to be our protection. He is what is safe, resting in His grace and salvation, living in His light, this is Life. Otherwise, it’s not Life at all, just a phony imitation. Nothing can separate us. We’ll find that truth in the next verse. That truth is for another day. Today, Jesus invites us to shed fear. His peace rests in our hearts. The unknown is known to Him. Christ the victor, on the cross, risen, ascended. All the power of death and the devil, completely defeated once and for all! It is finished! That is the beautiful message of Easter morning. 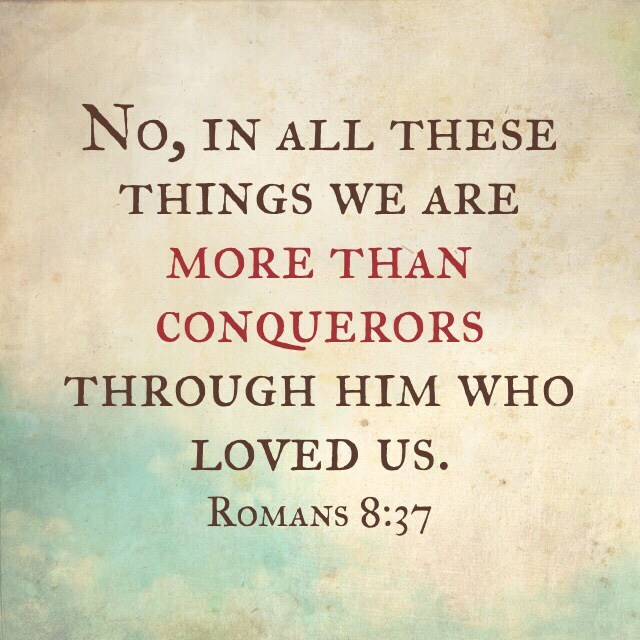 We are the conquerors. Vicariously we have the victory through Christ’s death and resurrection. Sometimes we relegate the victory to Christ and forget that He has given the victory to us in His atoning sacrifice. 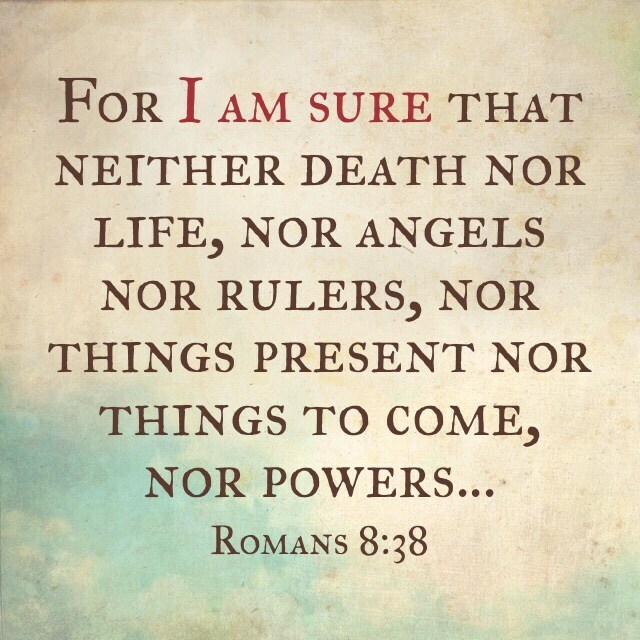 Death, the devil, the world, our sinful flesh…all defeated in our own lives. The victory has been won and is continuously won, everyday in our own lives, as Christ lives and works in our hearts and our homes. ‘More than’, hupernikáo, utilizes an “intensive prefix” in Greek. We are exceedingly or overwhelmingly conquerors. God’s work is powerful and real. We live in a powerful and real battle on this Earth. Satan tries to infiltrate our hearts, our marriages, our families, our churches. But we are exceedingly and overwhelmingly victorious. What a difference it makes to know the outcome of the war! We fight differently. We hold on tight as the battle rages. We hunker down and protect our family. We hurl the Living Word at Satan and fight the good fight to keep our hearts, our families, and our lives, because we know that Christ has already won. At times it doesn’t feel like you’re winning the battle, much less the war, but hold on to Biblical Truth. You are more than conquerors. Christ is in any and every situation in our lives with His victor crown. Lord, You love us. You know what each day holds for our lives. Keep us in your Word. Remind us of your complete victory in every situation. We trust in You. In Jesus name, Amen.